DOVER, Del. 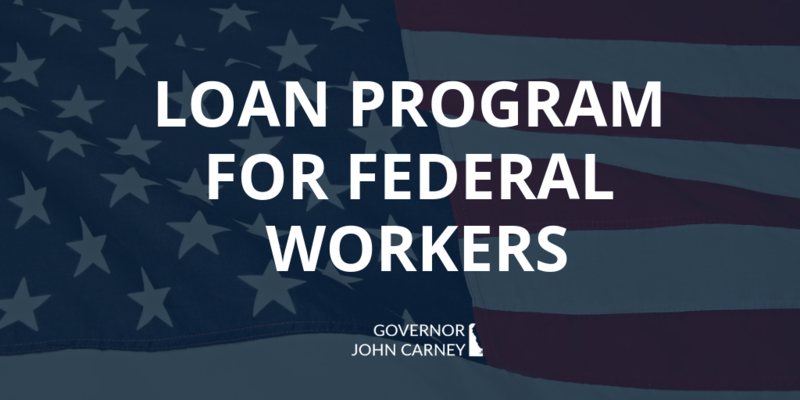 – Governor John Carney on Thursday announced a state-guaranteed, low-interest loan program to assist federal workers who are going unpaid during the federal government shutdown. Loans funded through the program announced Thursday would be made by a financial institution and with a loan guarantee from the Delaware State Housing Authority (DSHA). Workers and their families could use loan proceeds to keep up with their mortgages, pay utility bills, and other housing-related expenses during the shutdown. In partnership with the State of Delaware, West End Neighborhood House will assist workers in completing applications, and will offer optional financial coaching services. About 500 federal employees who live in Delaware continue to go unpaid. Under the new program, DSHA will guarantee the loans from revenue generated through the agency’s Homeownership Loan Program (HLP). Federal workers may access the loans with no credit check required, and will be eligible to receive up to one-month’s net pay. The loans will offer flexible payment terms and optional financial counseling through the $tand by Me program. Loan managers also will help applicants determine eligibility, complete the necessary paperwork, and the amount of the available loan. M&T Bank, in partnership with West End Neighborhood House, has agreed to make loans available statewide under the program. View more resources for furloughed federal workers.